After two days of building, we are at the half way point to finishing this medium sized two bedroom log cabin build. The Hansa Holiday C Log Cabin has 50 m2 of inner space and a handy 2 x 7 m veranda in front of the cabin for Alfresco dining or creating a nice outdoor sitting area. The cabin has two bedrooms, a bathroom, cooking corner, and large dining and living area. Five wall high windows in the hall let plenty of natural light in and open great views from the inside. 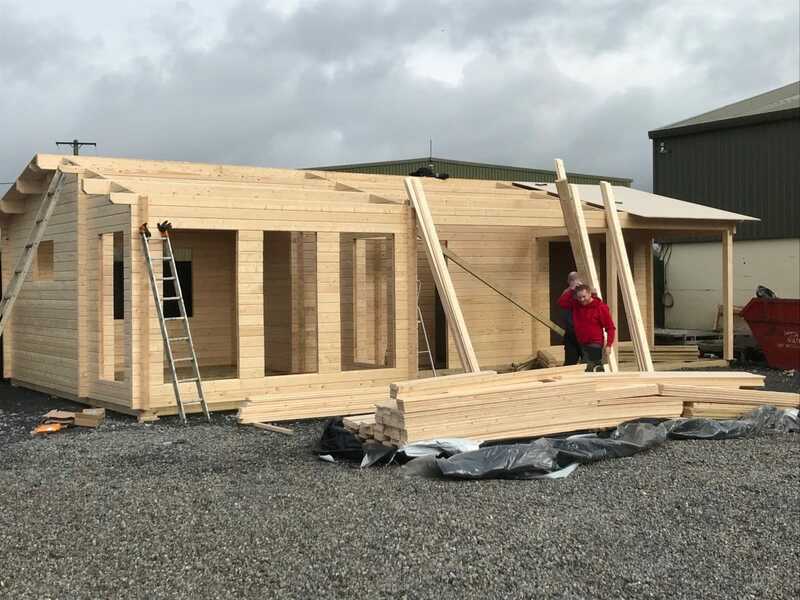 The standard cabin kit features very thick 70mm wall planks, double glazed doors and windows, strengthening metal rods in walls, metal storm braces inserted throughout the entire wall, 28mm floor boards, all inner doors, roof boards, roofing felt as well as all screws, nails and other fixings.